The folks at Positively Organic are positively impressive when it comes to combining super cute baby onesies and tees for tots with a socially-responsible business practice. Their 100% organic cotton and sweatshop free designs are great mix-and-match attire for little ones on the move. 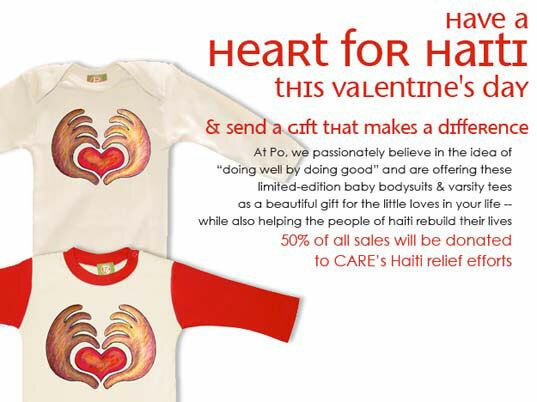 If you are looking for an eco-friendly way to share in environment and social outreach this Valentine’s Day, look no further than Positively Organic’s ‘Heart for Haiti’ limited-edition baby bodysuits and varsity tees. 50% of all sale proceeds will go to CARE‘s Haiti Relief Efforts. Not only is this a great way to contribute to Haiti’s rebuilding efforts, but it is also a unique opportunity to spread the message of doing good for one of the year’s most touching occasions. The folks at Positively Organic are positively impressive when it comes to combining super cute baby onesies and tees for tots with a socially-responsible business practice. Their 100% organic cotton and sweatshop free designs are great mix-and-match attire for little ones on the move. If you are looking for an eco-friendly way to share in environment and social outreach this Valentine's Day, look no further than Positively Organic's 'Heart for Haiti' limited-edition baby bodysuits and varsity tees. 50% of all sale proceeds will go to CARE's Haiti Relief Efforts. Not only is this a great way to contribute to Haiti's rebuilding efforts, but it is also a unique opportunity to spread the message of doing good for one of the year's most touching occasions.